Have you always asked yourself which customers your field reps visit and where? Are you interested in visualizing your field reps’ call reports on a map and possibly analyzing them together with other key indicators? 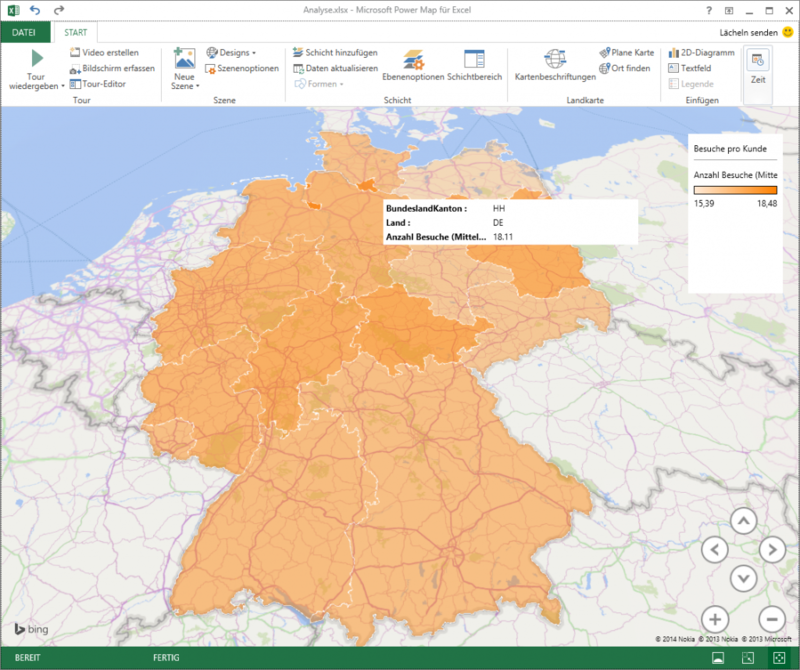 The new Power Map feature of Excel 2013 and Power Pivot for data analysis is able to create even complex visualizations. The following article will give you step-by-step instructions for the setup. For this purpose we use call reports entered into the portatour® field rep software which can be directly imported into Excel and updated at the push of a button. Your field reps’ call reports, e.g. 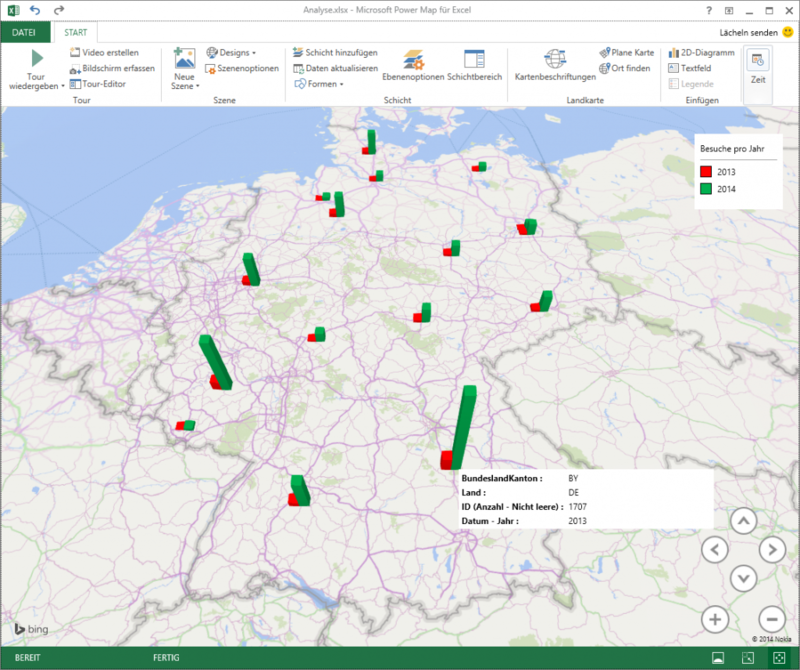 from the portatour® route planner for field reps.
Excel 2013 (or higher), Power Pivot and Power Map. A healthy amount of curiosity and creativity. Below you can see a view of Power Map for Excel. The map shows the number of calls per state, comparing the years 2014 and 2013. We can see that the number of calls has increased in all areas between 2013 and 2014. The following 4 steps are a precondition for the creation of analyses. 1) Install Power Map, which is automatically available to subscribers of Office 365 ProPlus and Office 365 Enterprise E3. Users of Excel 2013 without Office 365 subscription can download a preview of Power Map. Follow the installation instructions for Power Map. In addition, you also need Power Pivot, which is also available for Excel 2013 and must be activated. 2) Your call reports are imported from the portatour® route planner. For this purpose an OData interface is provided, which enables Excel to import (and subsequently update) data directly from portatour®. Go to the menu item Options > Excel data analysis in portatour® Anywhere to obtain instructions for the setup (requires company access with 2+ users). Before you continue, make sure that your call reports are available in Power Pivot in Excel. Hint: the “Relatedtable” feature only works if you have previously created relationships between the Power Pivot tables. 4) Now add the map by selecting Insert > Power Map > Map in Excel to start the data analysis on the map. Go to the top right below the heading “Choose geography” and select the following “Customer” fields with geopraphical data: State, Latitude, Longitude, Country, City, ZIP and Street. Underneath, link the respective meaning in Power Map with each selected field (e.g. “Street” with “Street”). To the left of each field you can see a circular button. Use it to select one of the visualization levels, e.g. “State” in order to classify the maps as shown in our example. Now you have set up the map and you can visualize your data on it. The map shows: more calls per customer are achieved in Berlin and Hamburg than in other federal states. You have all customer data and call reports available in Excel – use your curiosity and discover interesting values that you want to analyze and compare. In case you do not yet use the portatour® route planner register for a free trial.